Visiting the Senate can be organized into groups of minimum 5 and maximum 30 people by the Organizing and Promoting Events Center. 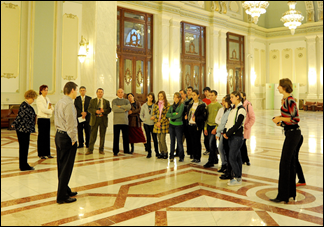 During the visits, guides from the Centre for organizing and promoting events will provide information on the architectural elements of the rooms, the structure and organization of the Senate, Legislative and Parliamentary Control, as well as the Senate’s history and other information of public interest, according to the demands of visitors. In addition to rooms currently open for visitation the circuit may included, depending on activities in the Senate, the President's Office, Official Exhibition Hall Europe and Plenary Hall. Those interested in visiting will be sent at least 24 hours before the day of the visit table with people who will attend the visit, with data on the identity card or passport and registration numbers of vehicles requiring access to Parliament House courtyard. For foreigners, the lists are sent at least 48 hours before the visit, in order to program guides for speaking foreign languages of international circulation. Visits can be made in all parts of the Senate or in part. Groups of visitors will be taken to the entry B3, ground by a guide and two persons from the protection and internal order, following their registration and inspections conducted by SPP. Exit the A1 or B3 entry. The visiting routes may change depending on the rooms and space for tourists at a certain time of day.